Industry will thrive at the Bilbao Exhibition Centre from 6th to 8th June thanks to the parallel hosting of Ferroforma, Subcontratación, Addit3D, Pumps & Valves Maintenance and Fitmaq, along with Workinn and Polveri & ecoCoating, another two events related to the industrial sectors. Over 1200 exhibiting firms from all over the world will participate in this great platform, which will be inspired on the principles of Industry 4.0 to offer innovations in key sectors such as additive manufacturing and 3D printing, industrial subcontracting, hardware, industrial supplies and DIY, pumps and valves, maintenance, second-hand machine-tooling and industrial jobs. The sum of these six events in a single space will offer a full journey through the most advanced industry, where visiting professionals are will be able to find customised solutions in manufacturing processes, the latest technologies, supplies and tools, as well as equipment for industrial processes and products for the maintenance of assets and facilities. It will be the biggest meeting point devoted to Smart Manufacturing which will be held in our country this year, and in which commercial exhibitions will be combined with technical seminars, live presentations, workshops and international programmes of B2B meetings in Halls 1,2,3 and 5 of the Basque exhibition centre. Over 18,500 professionals from 65 countries came to this multiple meeting in 2015, when the sum of industrial events promoted very interesting synergies and fostered new channels of collaboration between different sectors and companies. This year, industry will be consolidated with even more force, if possible, with the incorporation of Workinn, industrial job forum, Polveri & ecoCoating, space devoted to surface coatings, and Addit3D, fair devoted to additive manufacturing technologies and 3D printing, whose advance is unstoppable. The Pumps & Valves commercial team has developed a strategy that is focused on visiting professionals, thanks to which the list of visiting companies registered for the event includes firms from all of the sectors to which the fair is aimed, large user companies and engineering firms and multinationals working on a global level. They include leading companies, such as Pepsico Manufacturing, Repsol, Enagas, Galletas Artiach, Air Liquide, CNN La Naval, Vidrala, ArcelorMittal, EDP Naturgas, Unilever Foods Industrial, Maxam, CLH, Petronor, Técnicas Reunidas, Acciona Agua, Tamoin, Elecnor, Cadagua, Iberdrola Ingeniería y Construcción, Initec, Cobra and Sener. The main fields of interest marked by these companies on their registration forms are industrial pumps and control valves, followed by valves, processing equipment, technology and metering, testing and control and sealing equipment. They will all be the main sectors of the exhibition, in which 82 exhibiting firms will be participating. Furthermore, Pumps & Valves will once more be committed to combining the exhibition area with seminars and other spaces for professional exchange. On the first day of conferences, speakers from engineering firms and EPCs will talk about their investment strategies and projects in the medium term. “Internationalisation of Innovation: experience of the engineering sector” will be the title of the talks in which companies like Worley Parson, Amec Foster Wheeler, Técnicas Reunidas, ITAC, Idom, Gas Natural, KPMG and Sener, among others, are expected to participate. The second day will focus on more technical questions with speakers from ISA, Tetra Pak, ABB. Both days will share two common elements: the prevalence of the point of view of the user and the definition of contents based on an interest survey between professionals participating in the event. As a new thing, the Pumps & Valves programme will include “Innovation Workshops” in which exhibiting firms will briefly present their products and solutions, highlighting their most innovative and technologically advanced component. At Pumps & Valves, there will be an exhibition of the winning photographs in the 3rd edition of PHOTOINGENIA, the International Engineering and Architecture Photography Competition, organised by Tecniberia, Spanish Association of Engineering Consultancy and Technological Services Companies. 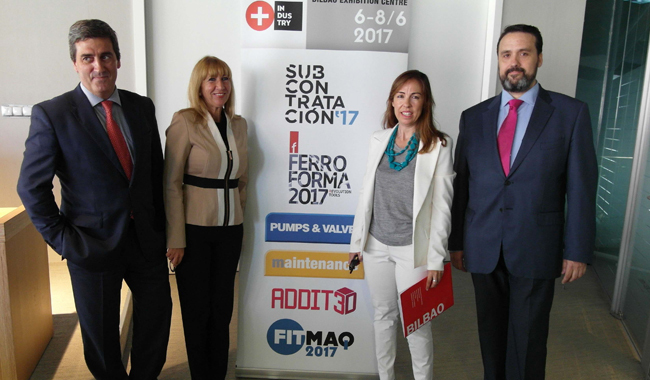 Visits to Petronor and Praxair will round off the Pumps& Valves programme, which is organised by EasyFairs and Bilbao Exhibition Centre.